Enjoy an Arabian Desert experience on this off-road tour from Dubai that takes you across the rolling sand dunes in a 4x4 vehicle. Soak up views of the expansive desert landscape on the way to a camp, where you can relax in a private tent with waiter service. 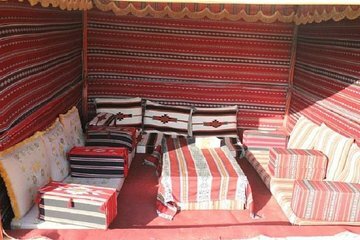 Partake in a variety of traditional activities, if you wish, such as henna painting, a camel ride and a belly dancing show. A barbecue dinner is served at the camp before the tour ends with return to the city.